Previously we�ve discussed how to lay out downlights in a room for general, ambient lighting purposes. Often times, however, you need your ceiling lights to provide ample illumination of a work surface in order to accomplish a task or job. This is task lighting, and it is frequently used in specific areas of a room, complementing the general lighting. When using overhead recessed lighting to illuminate a work surface or counter, the placement of the lights is very important, especially in relation to the user who will be performing the task. The goal here is to maximize the amount of light hitting the work surface, while minimizing any shadows or glare that can make accomplishing a task difficult. When lighting kitchen countertops, it is best to locate downlights between the face of the upper cabinets and the front edge of the countertop below. This will evenly illuminate the counter and, with a medium or wide angle beam, can highlight the front face of the cabinets at the same time. And if you have glass doors on your upper cabients, it will also get some light inside the cabinets. Bonus! Placing lights too far back from the counter (or relying only on the ambient lighting downlights located elsewhere in the room) will cast unwanted shadows upon the work surface when someone is standing at the counter. For illuminating office desks or dining tables, where someone is sitting down to accomplish a task, again our focus is to avoid casting unwanted shadows. In these situations, you want to position the light slightly in front of the person seated. Do not place the light directly over the seating area or behind it. 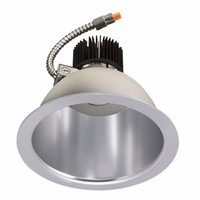 For locations where people are situated for reading or gathering, it is common to have focused downlights (such as adjustable recessed lighting, track lights, or multiple lighting systems) highlighting these areas. In these types of spaces, people are looking at flat surfaces such as books, magazines, phones, or tablets for an extended period of time and we need to consider how the lights reflect off those surfaces. Here, our goal is to reduce glare, as glare can cause eye strain, fatigue, and discomfort. Instead of placing a single adjustable downlight focused at an occupant location straight on, place a pair of adjustable downlights on either side of the seating position. This reduces glare as the light beams are not reflected back up into a person�s eyes, and having two or more light sources will reduce shadows. When lighting a work surface or gathering space for tasks or specific uses, always keep shadows and glare in mind. Understand where people will be standing or sitting while they perform these tasks and light accordingly.